"The Great War at 100: Its Shadow & Legacy" will be the topic of Middle Georgia State University's inaugural event of The Master Lectures & Conversations Series. • 5:30 to 7 p.m. Monday, Nov. 6, in the Eagle Conference Room, Museum of Aviation, Warner Robins. • 5:30 to 7 p.m. Monday, Nov. 13, in room 237 of the Professional Sciences and Conference Center, Middle Georgia State's Macon Campus. Both talks are free and open to the public. RSVPs are recommended at https://www.mga.edu/continuing-education/courses.php. The Master Lectures & Conversations Series is part of Middle Georgia State's redesign of its Continuing Education office. Dr. Kevin Cantwell, dean of Graduate Studies, is leading the office's revitalization. The Master Lectures series "promotes public engagement with the great ideas of our times," Cantwell said. "We felt that a set of public talks by the president of Middle Georgia State would be a great signature launch of the new series as he discusses why we should all know more about World War I." 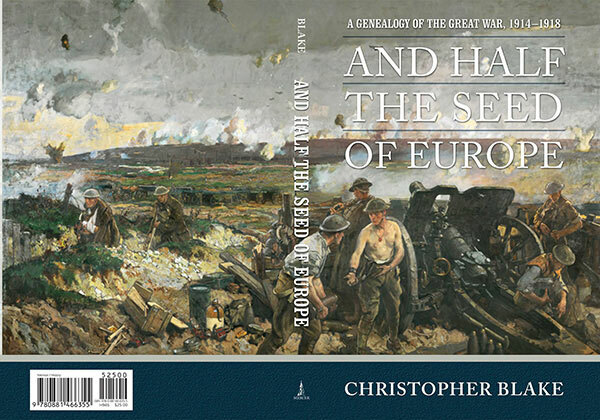 Blake, a member of the Georgia World War I Centennial Commission advisory board, is the author of the recently released "And Half the Seed of Europe: A Genealogy of the Great War 1914-1918," published by Mercer University Press. The First World War, or Great War as it became known, was ravaging the human family one century ago, changing forever the nature of military combat and restructuring the twentieth century in a way that was unimaginable before its course. With more than 35 million casualties, the Great War ranks among the deadliest conflicts in all history. While the Great War was hoped to be the War to End All Wars, it instead launched a series of geo-political struggles that defined the future century, and in the shadow of which we still live today. By the end of the War all the major combatants--including the United States--were engulfed in its flames and hostage to its fortunes. But the war was also very personal, shaping the lives of those who went to war, their loved ones, their families, and their future. That story of family is rarely examined in terms of the impact of the Great War. In this book, several family members, British and American, are the context for an understanding of how the War shaped our lives both in the past, and going forward. In the stories of individual combatants, and their family relationships, lie the clues to understanding who we are, where we came from, and where we might choose to go. Although the Great War is lost to living memory, its history lives on in the families whose grandparents, parents, spouses, and children engaged in the most titanic struggle in human history at that time. Copies of the book will be available for purchase and signing at both talks. Blake's appearance at the Museum of Aviation dovetails with an ongoing project of several Middle Georgia State faculty and students to create and set up a display about World War I at that facility. For more information about The Master Lectures & Conversations series, call 478.929.6712 or email Cantwell at kevin.cantwell@mga.edu.